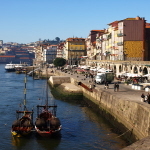 Porto is one of those aesthetically pleasing destinations that is a treat for both the eyes and the camera. It’s not all prim and proper perfect but there is something about the old city that is totally enchanting, even the parts that are showing signs of decay. There are visual joys everywhere, so picking out only 10 is a bit unfair. However, if we were forced to choose these would be our favourite sights in Porto. 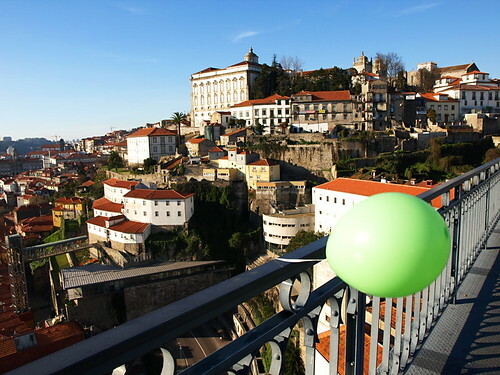 The imposing Dom Luis I Bridge over the Douro River offers a number of panoramic views of Porto. Cross it for postcard-esque vistas from Cais de Gaia or climb to the upper level – avoiding being mown down by the Metro – for a cormorant’s eye view of the city (actually it’s a lot higher than the average Porto cormorant flies). The ultimate view of Porto and the Douro River is from the cable car that travels from the wine cellars in Cais da Gaia to the monastery high above the rooftops. It takes five minutes and costs €5 (one way) and a bucket load of sweat if you suffer in the slightest from vertigo. Beautiful old tiled images decorate buildings galore on Porto’s streets but some of the best examples are found in the São Bento train station near Praça da Liberdade. 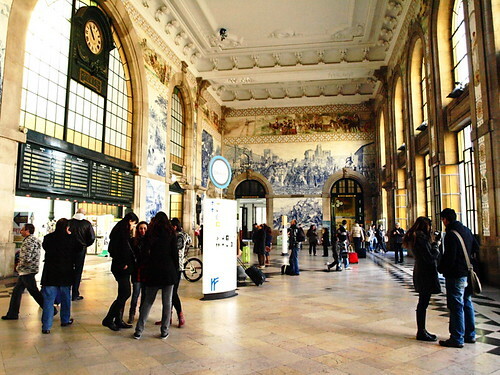 Historic scenes in antique blue tiles dating from the end of the 19th century transform the entrance to the station into a living piece of Porto’s history. It would be a great location for a dramatic re-union between parted lovers at the end of a romantic movie. Churches aren’t everyone’s cup of char but São Francisco’s moody Gothic façade and dripping in riches interior are worth checking out. 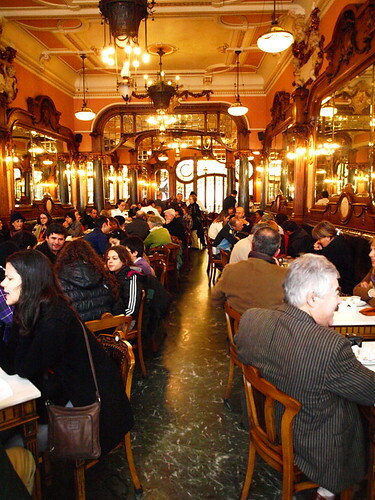 One of Europe’s most famous coffee houses isn’t as touristy as you might think. The opulent interior is indeed majestic and whilst seats are at a premium, prices aren’t as high as you might expect for an establishment of this calibre: it still oozes Olde Worlde elegance. 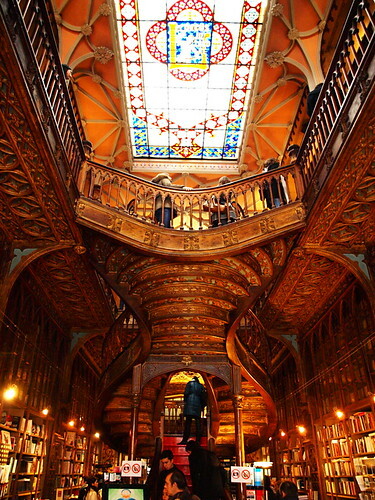 There should be a law passed that all bookshops should look like Lello & Irmão. This exquisite shrine to the printed word will excite any book lover; you just know there’s a section dedicated to forgotten books in here. 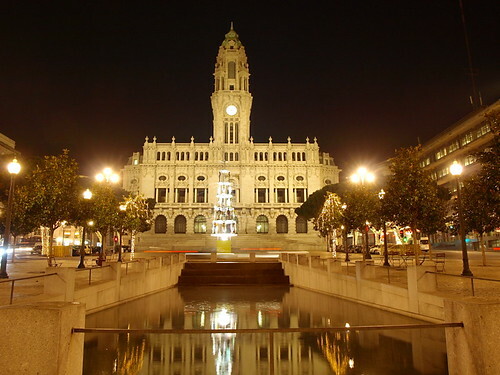 The elegant and romantic old heart of Porto is found Avenida dos Aliados where a long tree-lined square stretches from the town hall to Praça da Liberdade. 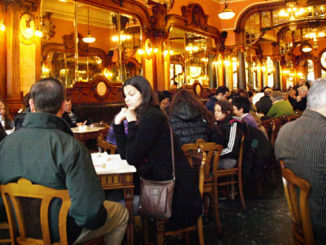 Neoclassical buildings, statues that range from conventional to the avant-garde, pools, benches to sit and watch the world go by, pavement cafés and shoe shine stands. This is an avenue designed to be strolled hand in hand… or partied in during cultural events. €2 and around 225 steps (it’s hard to count when you’re huffing and puffing) takes you to the top of the Torre dos Clérigos (Clérigos Tower) and pretty much unbeatable 360 degree views of Porto. Where is it? 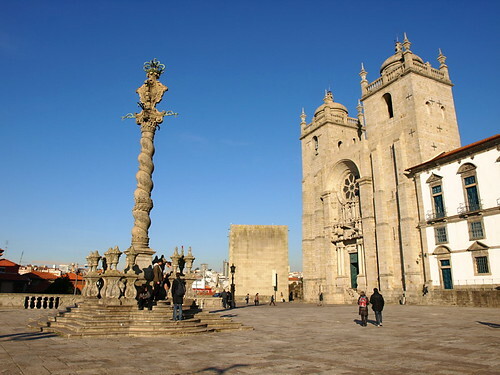 This was once the tallest structure in Portugal… if you’re in Porto, you’ll soon know where it is. Even if ornate religious buildings have you stifling a yawn, a hike up to the city’s Cathedral is worth the effort. For a start it’s an impressive looking Gothic building dating back to the 12th century (looks even better after dark) and the curved column called the pelourinho (whipping post) in the square beside the Cathedral is an interesting curio. This one is apparently a reproduction so no-one has been actually whipped there as far as we know. There are also good views across the city. After dark is especially atmospheric and a trip down the Escalas das Verdades to the riverside offers a quite different view of Porto’s narrow old streets. 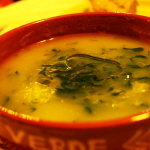 You can imagine the Mercado do Bolhão as a thriving bustling centre of commerce. Now it looks as though it is way past its best. Like some other parts of the city there is still a faded grandeur about it that makes is quite a captivating place to explore. 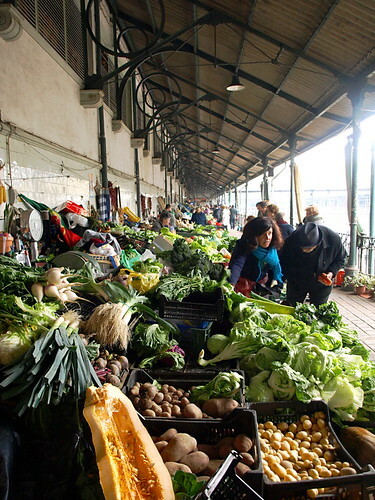 On the upper tier women sell huge bunches of kale destined for pots of caldo verde whilst the lower market area houses caged chickens and duck, flowers and strings of garlic and dried chillies.